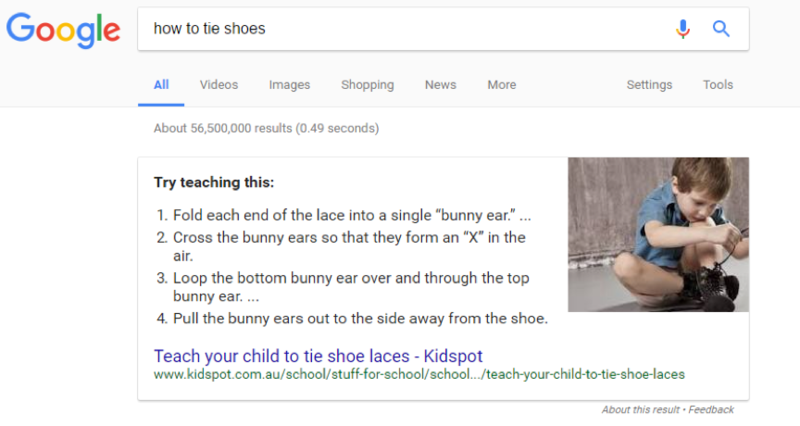 OK, Google: How Do I Optimize My Content for Featured Snippets? For brands, this raises an important question: How do you become the default answer for a voice search query? You know the recent buzz around “featured snippets” – the boxes that appear at the top of some Google search result pages, providing a brief answer that, brands hope, leads the user to click for more detail. Featured snippets are an opportunity to quickly leapfrog your competitors and land that premium zero spot even when your page doesn’t rank in the traditional search results. Featured snippets appear prominently in both mobile and voice searches. In the future, these types of searches are only likely to increase, so optimizing your content for mobile and voice search should be a priority. Before I get to voice search, let’s take a look at the anatomy of a featured snippet in more detail. 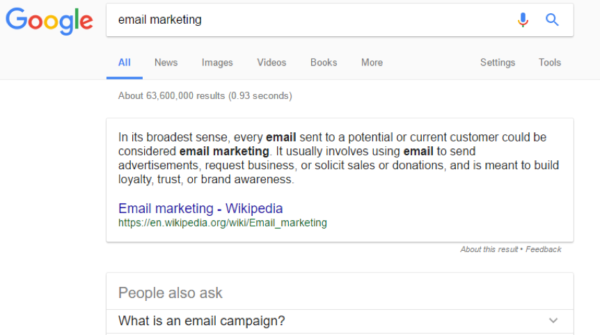 What exactly are featured snippets? Featured snippets can take a number of forms, depending on the type of information they are trying to convey. By understanding the answers people are looking for when they perform a search and formatting your content with the featured snippet in mind, you can often easily snag a featured snippet. To avoid wasting time, optimize strategically for featured snippets. The best approach is to target terms where your content already ranks on the first page of results and where your competitor provides the featured snippet on that page. You can do this via a tool like SEMrush, which lists featured snippets that a particular site ranks for. Start by targeting the low-hanging fruit, for example featured snippets that don’t give the correct answer or those drawn from poorly formatted or low-quality sites. Once you’ve decided on a list of terms to target, you can set about optimizing your content. Repeat the question (e.g., the search query or the question implicit in that search query) clearly and prominently on the web page. Provide a short and direct answer. Answer the question as fully as possible. For example, include a list of instructions, images or diagrams, data, or rankings. Structure your page in a logical way so both users and search engines can quickly and easily find the information they need. Remove all extraneous information, anything off topic. Concentrate on providing the clearest and most thorough answer to the question posed by the searcher. Much of this is simply common sense. 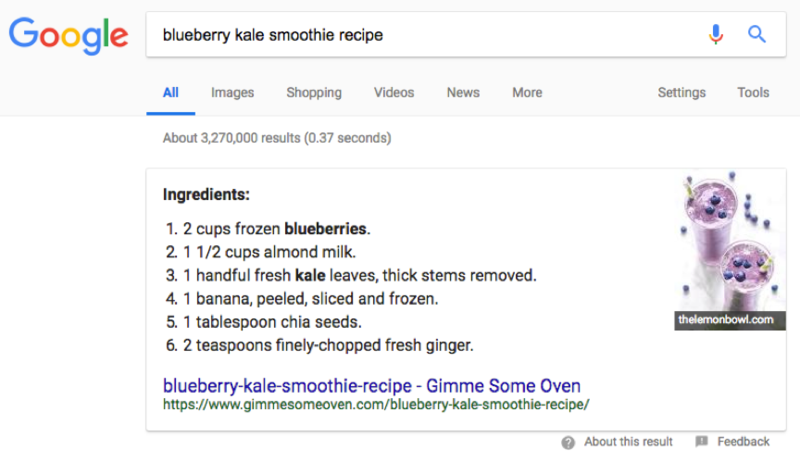 For example, imagine you run a food blog and are trying to land a featured snippet for your blueberry and kale smoothie recipe. You might ask what this all has to do with voice search. A recent Backlinko study found that 41% of Google voice search results came from featured snippets. Hence, ranking for a featured snippet gives you a better chance of appearing in voice search results. As searchers move into a more voice- and mobile-centric era, targeting featured snippets should become a key part of your SEO strategy. Voice Search: Is Your Content Prepared for the Verbal Revolution? It takes constant work to maintain your Google rankings and keep abreast of changes to Google’s algorithms. The introduction of featured snippets is part of a larger shift in the way searches happen. Reviewing the opportunities and threats featured snippets represent, preferably via a thorough audit of your site, is the only way to keep ahead of the competition and maintain or increase your current levels of organic traffic. Get more insight on SEO from Stephan Spencer at Content Marketing World. Register today for the Sept. 4-7 event in Cleveland, Ohio. Use code BLOG100 to save $100. 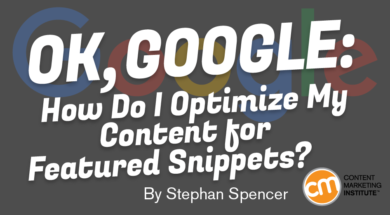 Stephan is an internationally recognized SEO expert and bestselling author. He is the co-author of The Art of SEO, author of Google Power Search and co-author of Social eCommerce, all published by O’Reilly. Stephan founded Netconcepts in 1995 and grew it into a multi-national SEO agency before selling it to Covario. He hosts two podcasts, The Optimized Geek and Marketing Speak. Follow him on Twitter @SSpencer.